Since I was 4 years old, I had always wanted to be a musician. I played the keyboard and piano for 14 years but the music dream didn’t really come true. Ended up doing arts and design and somewhere over the years, started doing something else, completely different. So, here’s where I am now. No complaints though. I love what I do now. Last evening, I was at Zouk and for the first time, heard the local indie/po punk band – Plainsunset played. When Jonathan and my very cool colleague Ray (who also plays in another local band, Kate of Kale) first told me about Plainsunset some weeks ago, I had never heard of them. I was actually surprised that Jon has their albums. I heard their songs from his iTunes collection and thought they were quite good and last night, hearing them live was pretty awesome! Ok. I didn’t really go to Zouk for the bands. It was more for work. And that’s where the other group of local young talents are found. At the Yahoo! Mobile Developer Awards (YMDA) part. I am trying not to pull anything from the press release into this post. You can find out more yourself, if you are one of those developers who are exploring to develop cool applications for mobile. 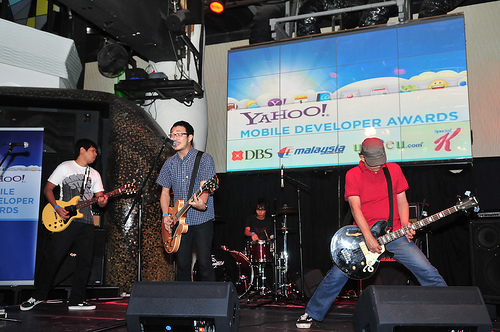 Briefly, the competition is about encouraging young developers from tertiary institutes to innovate and create mobile-optimised applications using Yahoo!’s latest mobile development platform – Yahoo! Blueprint based on real business briefs from 4 corporate sponsors, including DBS Bank, Kellogg Asia, Malaysia Airlines and travel portal UEEEU.com. The party last night was to award 4 winning teams and one Best in Show. What impressed me most was the quality of submissions from the young developers who created what we called mobile widgets . Check out some of the screenshots of the winning mobile widgets. IZ Reloded’s who joined us at the party had done some video interviews and shared some pictures of the event. Looking at the local bands and the young developers, I have to say, we have some really talented people in this city. This entry was posted in Technology & Digital, Travel and Events and tagged kate of kale, plainsunset, widgets, yahoo mobile developer awards by Priscilla Tan. Bookmark the permalink. Kudos to Yahoo! 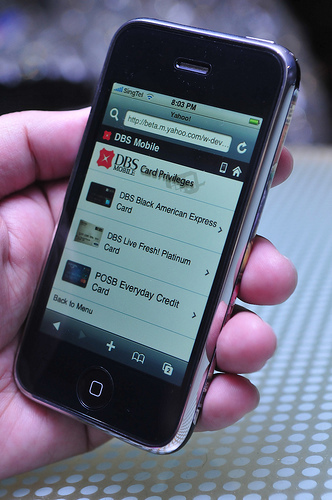 for uncovering these young talents in Singapore, and for propelling the growth of the mobile platform here! podcamp, thanks! stay tuned for more updates! website, or use for contextual backlinks?